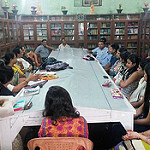 On 20th September, Vimarsha was organized on the topic - Service in Worship at Rastriya Hindi Pustakalaya at Tinsukia. Vimarsha was started at 3:30 pm with vedic chanting and ended at 5pm. There were 33 people attended the program.